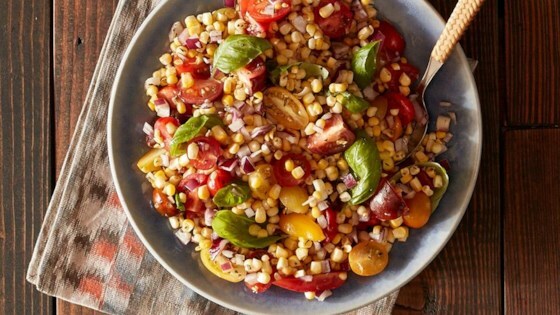 "Fresh, grilled corn on the cob tossed with heirloom tomatoes, red onions, herbs and a light dressing from Tiffany of Crème De La Crumb." Preheat grill to medium heat and place a 12x12-inch piece of Reynolds Wrap(R) Non-Stick Foil on the grill. Whisk together all dressing ingredients in a small bowl. Add to corn salad and toss to coat. Serve immediately. Use Reynolds Wrap® Non-Stick Foil to prevent items like vegetables or smaller pieces of food from falling between the grill grates. I did double the vinaigrette, but otherwise no changes. It was awesome! I will definitely make this again!